We’ve seen this movie play over and over again in the St. Louis region. This time it’s set in University City. The inner-ring municipality issued a request for proposals (RFP) last year (PDF). One response was submitted last September. 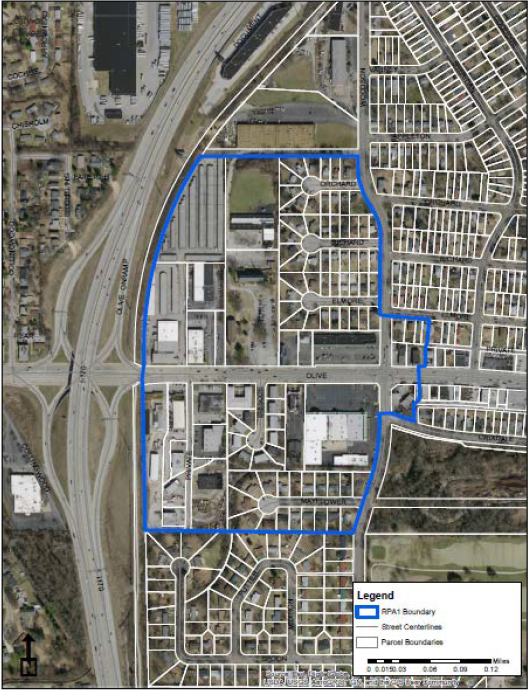 University City reissued the RFP this February (PDF) with an expanded redevelopment area. A submission by Novus was presented to University City’s Tax Increment Financing (TIF) Commission April 4, 2018 (PDF) (See video – University City Patch). 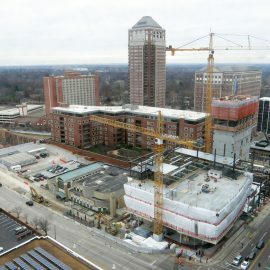 Novus has 44% the land acquired or under contract and the big box tenant is on board. 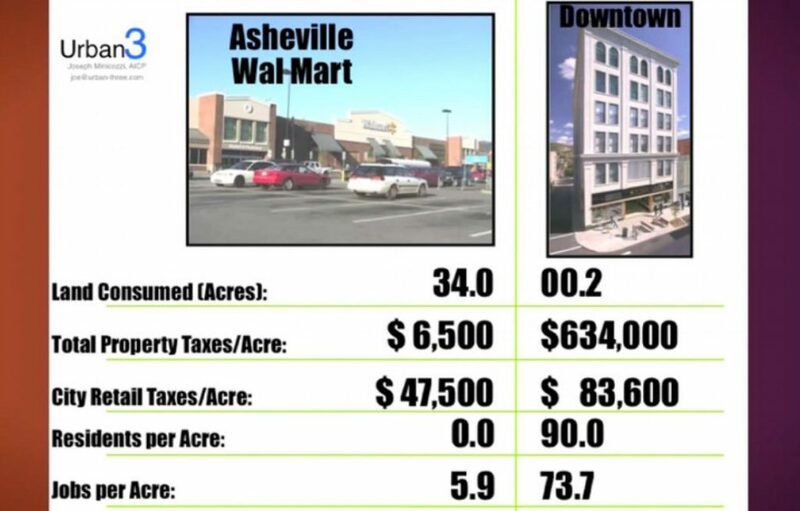 According to the Olive Boulevard Commercial Corridor and Residential Conservation Redevelopment Plan (PDF) by PGAV Planners, the project costs total $189.5M with $70.5M in Tax Increment Financing (TIF). In order to do a TIF the area must be blighted. The plan concludes the area contains improper subdivision and obsolete platting, is an economic liability, and a menace to public health, safety, morals and welfare. The Cost/Benefit Analysis (PDF) also by PGAV. There’s a lot in these documents; have a look. The numbers look good. Assessed values are estimated to increase from $6.7M to $20.8M (in 2041) with assumed growth at 3% per year. Annual retail sales to go from $6M to $173.3M (Novus says $162.5M) and grow at 1% per year. As a major entryway to the City, the Site and area significantly impact the City’s image and represent a critical redevelopment opportunity. It is comprised of numerous parcels under private ownership. The City’s intent in issuing this Request for Proposals (“RFP”) is to encourage retail and/or office, hospitality and residential development of the Site and help stimulate the overall redevelopment of the Olive Boulevard corridor and adjacent residential areas. 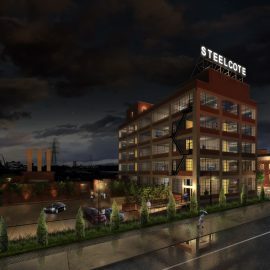 Redevelopment of the Site will demonstrate the highest quality design and architecture; include a thoughtful and balance mix of uses that create a regional destination and serve local needs; incorporate unique signage, art or other amenities that signify the area as entry to the City; and be consistent with community standards and goals. The Site represents an outstanding opportunity for a public-private partnership. Responsive proposals must demonstrate: (1) successful experience with similarly scaled developments, (2) economic and social benefits to the City, and (3) consistency with applicable plans, regulations and visions for the area. University City is a vibrant community of about 35,000 people and is known for its diversity and unique assets — an eclectic mix of commercial activities, historical architecture and contemporary construction, cultural and recreational opportunities, and fantastically diverse residents. Community and regional retail. This is the most preferred use for the Site. A significant retail anchor is desired to support the overall Site redevelopment. A transformative mixed-use development that meets community shopping, service, employment and housing needs, and includes growth opportunities for other areas along the corridor. Creative architecture that will appropriately represent the gateway to the City. Position the development to respond to shifting market conditions; ensure its sustainability. Sensitivity to the surrounding residential land uses; directly or indirectly stabilize and revitalize adjacent neighborhoods. Attract businesses that deliver tangible returns on public investments, including sales tax generation, job creation and property values. This plan meets some of the preferred uses and development objectives in the worst ways, and works against others. Why is a significant retail anchor so preferred? Is what leads to this being the preference at the root of how and why development patterns are what they are today? 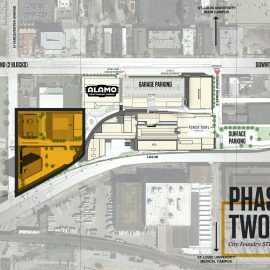 Can any development with this site plan meet the stated goals and build upon the assets of the city touted in the RFP? The proposal exemplifies just about every negative aspect of St. Louis dysfunction and of how we approach development. The St. Louis region has a long, terrible, crippling history of displacement for highways, urban renewal, airport runways, and development. Big box developments Kirkwood Commons, Brentwood Promenade, Maplewood Commons, Richmond Heights Menards, just to name a few, have mowed down neighborhoods. Often poor, disenfranchised, Black neighborhoods. Colin Gordon said Kirkwood took more homes from Meacham Park than they originally planned with the community. The city chose to turn the 100 and 200 blocks of the neighborhood into the Kirkwood Commons in 2000, demolishing over 200 homes in the process. Clark said removing the homes displaced many Meacham Park families. The sense of community in the neighborhood began to dissipate, even though many of the people received a house for a house. Displacing locally-owned businesses for outside-owned ones is a determent for the regional economy because more wealth leaves the region. St. Louis’ Chinatown downtown was displaced by Busch Stadium in the 1960s. A new one sprouted along Olive in University City. The owners of the Public Storage aren’t interested in selling so eminent domain may be used to force a sale. Some homeowners aren’t interested in selling either. Eminent domain wasn’t brought up in those cases, but there’s certainly a chance it would be used. Focusing development incentives on expanding retail sales is a losing economic development strategy for the region. The future of sales taxes as a principal source of revenue for local governments should come into question for several reasons: its inherent volatility; the likelihood of a long-term restructuring of retail trade; increasing level of sales taxes discourages spending and local sales in favor of non-taxed internet sales; and, the motivation this tax source provides to focus scarce tax dollars on incentivizing a type of development that appears to yield very limited regional economic benefit. As local governments come under increasing fiscal stress, the impacts of billions of dollars in forgone revenue will become increasngly apparent. NextSTL ran the Executive Summary a year ago. It’s a devastating indictment. The conclusions of East-West Gateway’s study go unheeded because of the incentives built into the St. Louis region’s fragmented government structure. If every player refrains from incentivizing, retailers will probably still find a way to sell us stuff, and the wealth that would have gone into the retail incentives could go to something else. But if one player incentivizes and wins, it gets the tax base, so they all incentivize, and we all lose. Chasing sales taxes is especially seductive since they can be paid by non-residents (non voters) thus less politically sensitive than property taxes. TIFs take 100% of the property tax base increase, but 50% of the sales tax base increase. The sales tax pool, of which University City is a net taker, doesn’t apply to the optional sales taxes a municipality may levy. 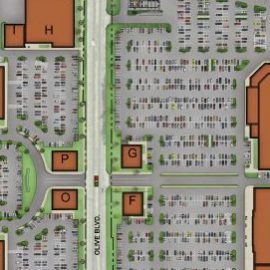 For the proposed development I-170 and Olive are expected to ferry many shoppers to its doors. Drawing in shoppers from elsewhere is not a game every municipality can win. Better Together’s studies have revealed that extreme fragmentation in the St. Louis region fosters intra-regional competition among the City of St. Louis, St. Louis County, and the 90 municipalities in St. Louis County. The result of this environment is a hyper-localized definition of economic and Community success—providing the highest level of services and amenities not at the lowest overall cost, but at the lowest direct cost to the individual municipality’s citizens. With each individual municipality accounting for just a fraction of the region’s citizens, each has over 1,000,000 citizens from which to extract revenue. This competition for revenue has permeated the psyche of local governments and St. Louis’ fragmentation has created a prisoner’s dilemma, wherein municipalities must either compete or lose out—resulting in revenue from their citizens going into the coffers of neighboring municipalities. This regionally debilitating dilemma is present in an insatiable intra-regional pursuit of sales tax revenue amongst municipalities that have the resources to compete and an abuse of municipal courts in many communities that do not. We’ve seen tax base shifting rather than growing. A sign of the opportunity cost of the application of development incentives. 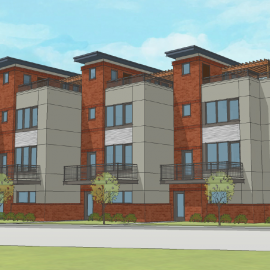 The developer predicts this development will have $162M in annual taxable sales. The net new sales to University City is probably large. But net for the slow growth St. Louis region, probably small. In other words it would add more square feet of retail space to the region, but no new shoppers. The taxes from sales shifted here would in part go to pay the TIF, so for any sales that would have been at a non-TIF’d location results in net negative public dollars. 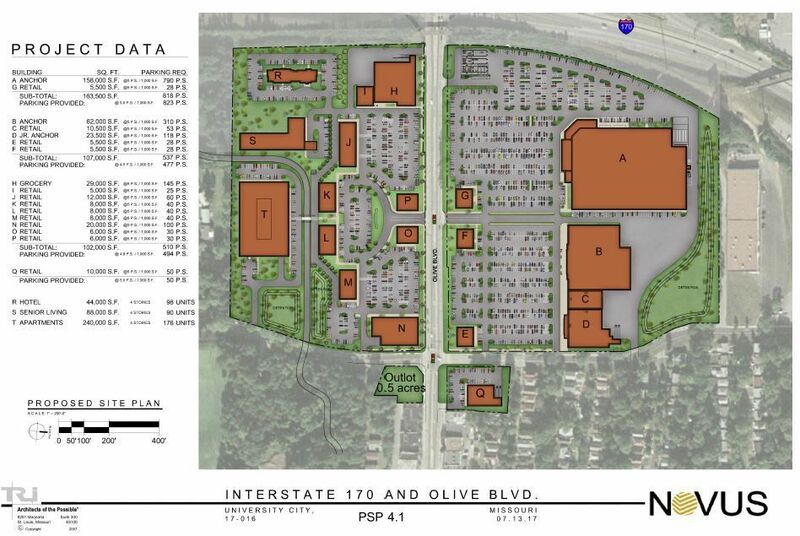 Speculation in the urbanstl forum is that the big box involved is a Costco. There are three other Costcos in the St. Louis Region quite far away, so one here probably won’t lead to the closure of one of them. But the big box and all the other retail spaces planned may strain other retail locations into closing. So long as they are in another municipality, that’s someone else’s problem. But hey that’s competition at work. Remember there are tax subsidies involved, direct in a TIF and indirect in the public infrastructure and services provided. The seductive sales tax is a cruel mistress. Taxable sales were crushed in the last recession. Understandable that in hard times people dial back their spending. Meanwhile property value doesn’t disappear as fast, and people certainly still try to earn income. Greater reliance on sales taxes means taking on greater risk exposure. 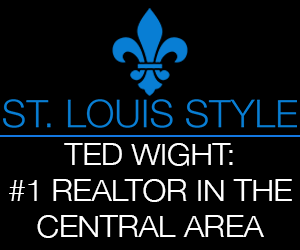 NextSTL – How’s Your Tax Base St. Louis? The redevelopment are contains 107 parcels over 50 acres. The proposed development would be more coarse. The fewer pieces the more each piece’s fortunes impact the whole. This site plan does not support the stated vision. Inviting more cars makes it less safe, efficient, and connected for all users. Olive is fronted mostly by parking. The buildings near Olive are set back and don’t face it. The plan renders the area even more auto-oriented towards auto-mandatory. Forcing driving is a terrible economic development strategy as most of the wealth put towards it leaves the region, as well as crowding out other household needs and wants. The plan also defeats University City’s investment in nice sidewalks, lighting, and planters that on Olive. Given the vision the trend should be to turn Olive from a stroad to a street. Street parking would help walkability, protecting pedestrians from moving traffic. U City might put a traffic calming device near the exit with I-170 to make it clear it’s no longer a highway just for cars, but that drivers are on a street in a complex town environment that has more than just cars. Granted these might be tough to implement because Olive is maintained by the state. Though for the type of development proposed it’s a feature as a wider swath pay to maintain the infrastructure, but U City gets more of the tax base. Big boxes are seductive because they can generate a lot of sales taxes, but they take a lot of land, infrastructure, and services. The land devoted to parking has low value. The plan contains over 2000 parking spaces. The traditional development patterns usually beats the auto-oriented one. The plan reaches a finished state on a short time scale. That’s all it’s likely to be. In an incremental approach, smaller chunks are enhanced at a time. If one doesn’t work, it was a small bet so the failure is less costly. The incremental approach is more resilient. Are the TIF plan’s assumed annual growth of property value of 3% and taxable sales of 1% a safe bet? The development could end up like one of the region’s dead malls. I think the only negatives this proposal is missing is that it doesn’t have a levy mostly paid for by the rest of the nation and isn’t on the edge requiring new infrastructure. University City should be looking for the next increment to enhance the area, not wipe it away for yet another clone of the experimental auto-oriented development pattern.